The StreamCare program provides eligible landowners with free weed control and tree planting along the creek. StreamCare is currently offered along Big Creek, Smith Creek, Johnson Creek and Beaver Creek. If you choose to sign up for StreamCare, we will commit to controlling weeds, planting native trees and shrubs, and maintaining the area along the creek on your property for 5 years free of charge. Our staff will obtain any necessary permits and supervise contracted crews to complete the work. Our expert staff can evaluate the area along the creek on your property. We will determine the weed control needs and discuss the area we would recommend for planting. Our services are offered free of charge. We are non-regulatory and all of our observations are strictly confidential. EMSWCD will pay for permits, labor, plants, materials and maintenance. StreamCare is offered for interested landowners along Big Creek, Smith Creek, Johnson Creek, and Beaver Creek. Big Creek Watershed– All land owners along the creek. Smith Creek Watershed– All land owners along the creek. 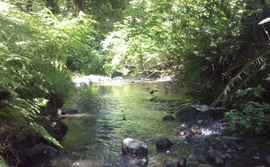 Johnson Creek Watershed– All land owners along the creek with property outside of the city limits of Gresham may be eligible for StreamCare. Beaver Creek Watershed– All landowners with property along any fork of the creek outside of the city limits of Gresham may be eligible. Call Lucas at (503) 539-5764 to determine if you are in the eligible areas. StreamCare participants enter into an agreement with the East Multnomah Soil and Water Conservation District (EMSWCD). You agree to allow us access to the project area at agreed upon times. You also agree not to alter or remove work completed, not to place or build structures in the project area, and to notify EMSWCD if the property is sold. If you own livestock, they must be kept out of the project area and manure cannot be stored in this area. We may provide you with a sign to post in or near the project area so your neighbors will know how to contact us to sign up for StreamCare, too. Call Lucas at (503) 539-5764 or email at lucas@emswcd.org.